The Solaire, which opened to tenants in May. A few years ago, the Ripley District was home to auto body shops and warehouses. But with the completion of a new apartment building and work starting on another, this handful of blocks between the Red Line and Georgia Avenue in downtown Silver Spring is on its way to becoming a neighborhood. In May, residents started moving into the Solaire, located at 1150 Ripley Street. I previously wrote about the building's nine live-work units, which allow residents to operate businesses out of their apartments. Montgomery County officials were so nervous about kickstarting the redevelopment of the Ripley District that they gave developer Washington Property Company $5 million in public money to help cover the costs of the 17-story high-rise, but today it's 25 percent leased. Across the street is Eleven55 Ripley, a mixed-use complex containing apartments, rowhouses, and retail space. Construction began in December and the building should open in late 2013, according to its developer, Home Properties. Together, the two buildings will deliver over 600 apartments, several new shops and businesses, and a pair of pocket parks to the Ripley District. 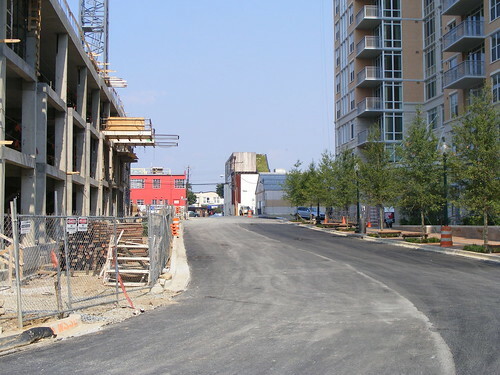 And to support them, the county has extended two streets, which will eventually connect the neighborhood to the rest of downtown Silver Spring. Last month, I stopped by the Ripley District to check out its progress. So far, things are looking good. The newly rebuilt Ripley Street. Eleven55 Ripley is on the left, while the Solaire is on the right. 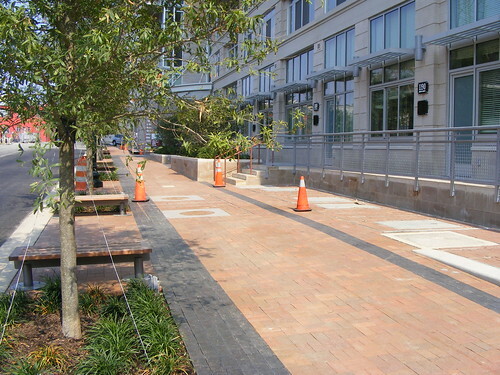 As part of both projects, Ripley Street was widened and given curbs and sidewalks. It's remarkable how much the street has changed from a few years ago, when the street had no curbs or sidewalks and the asphalt was cracked and broken. Ripley has also been extended, curving north to connect with Bonifant Street and the Silver Spring Transit Center, which should open later this year. The new segment of Dixon Avenue, which currently dead-ends at a parking garage. Dixon Avenue, which runs parallel to Georgia Avenue between Wayne Avenue and Bonifant, will also be extended one block south towards Ripley Street. 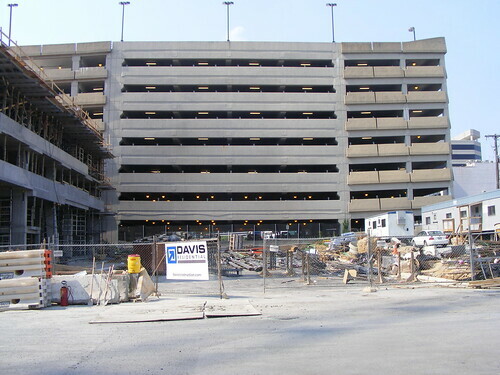 Next week, this public parking garage will close so that Montgomery County can run the street through it. 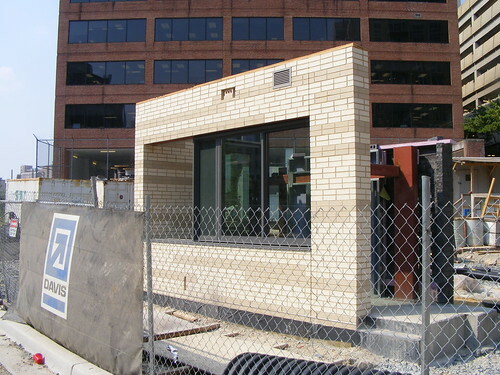 Eventually, Dixon will continue another block south to Silver Spring Avenue. The new street will run through the Eleven55 Ripley project, with apartments and rowhouses on the left side and a a mid-rise apartment building with ground-floor shops on the right. While it's nice to see more retail in this neighborhood, it will be largely invisible from Georgia Avenue and partially hidden by the parking garage, which will make drawing customers a challenge. Sidewalk in front of the Solaire. The streetscape in front of the Solaire is basically finished, and it looks pretty good, with lots of trees and benches. The sidewalk is pretty wide, and it might seem like too much considering how desolate this area is now. It will probably be a lot busier once the transit center opens. Here's one of the nine "live-work" units on the ground floor of the Solaire. As I wrote before, these apartments have a separate "work space" that can be sectioned off from the rest of the unit, along with their own entrance from the street and their own address. The walkway in front of them leaves a lot to be desired, however. Given how wide the sidewalk is, having an additional path isn't necessary. This space might be better utilized as small patios or "front yards" for each unit similar to those at the Silverton, a building on nearby East-West Highway. Likewise, Eleven55 will have several three-story rowhouses at the street level, which will also have their own private entrances. Shalom Baranes Associates, the firm that designed the building, did something similar a few years ago at the Odyssey, a condominium in Arlington. Together, Eleven55 and the Solaire should create a pretty nice street; though the buildings are among downtown Silver Spring's tallest, both will have front doors and stoops on both sides, giving the block a more residential, human-scaled feel. They'll also provide more "eyes on the street," making the area livelier and safer. A preview of what Eleven55 will look like when completed. 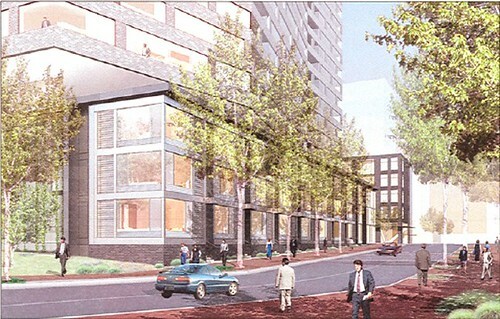 Previous renderings of Eleven55 made it hard to see what the building's exterior would look like. That's why I was glad to find this mockup of a portion of Eleven55's façade, which allows the builders to test out the architect's design - what materials to use, how the windows will work, and so on - before applying it to the building as a whole. Now we know the upper floors of the building will have a sort of sandy-colored brick veneer, while the lower floors will probably use a darker-colored brick. The stripe pattern appears to be arbitrary and I'm not sure what purpose it serves, but it won't be noticeable from the street anyway. A Red Line train passes the pocket park. 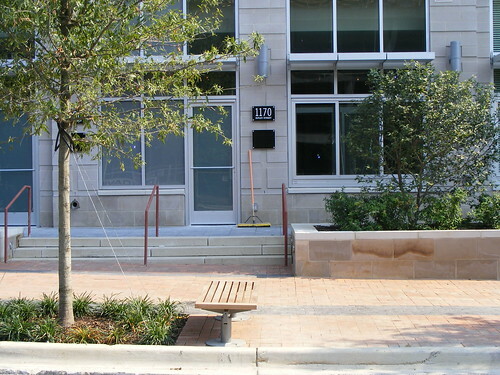 Like most new developments in downtown Silver Spring, both buildings on Ripley Street are required to have some sort of public open space on site. Here's the Solaire's pocket park, wedged between the building and the Red Line. The concrete pylons, whose wood accents and machine wheels recall the industrial buildings that used to line the train tracks. They also have inlaid metal panels with the Solaire's address on them, also playing off of the industrial theme. It's unclear whether the translucent canopies are meant for shade, because they're not very large and don't line up with the benches. A bigger issue, however, is how well-used the space will be. 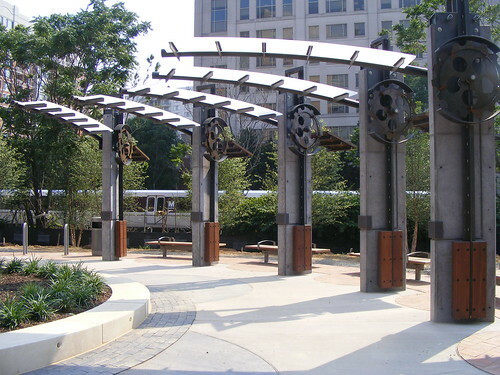 Many pocket parks in downtown Silver Spring are so badly designed they're useless, but this park, along with another one being built at Eleven55 Ripley, appear to be both attractive and functional. It will also be adjacent to the Capital Crescent Trail when it's eventually extended to Silver Spring, so bikers and joggers might one day stop here to rest. Open space is important in an urban district, but perhaps it would've been better if property owners could contribute land or funding to create one big park rather than a bunch of little ones. Pocket parks are great for sitting and eating your lunch, but they don't lend themselves to much else. 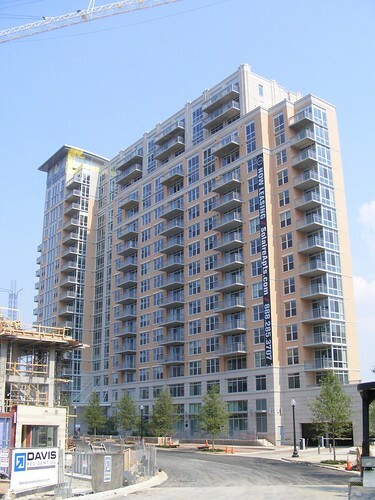 There are some bigger parks with playgrounds and playing fields in the neighborhoods around downtown Silver Spring, but there are probably enough apartments being built downtown over the next few years to demand a park of their own. Overall, the two new apartment buildings going up on Ripley Street should be a great addition to downtown Silver Spring. As I've written before, Silver Spring has been held back by buildings that are either unattractive or hostile to the pedestrian experience. Hopefully, the Ripley District will set the bar high for future development. Check out this slideshow of the Ripley District under construction. Great writeup, Dan. Thanks. Looks like the new construction is apartment-oriented. Any new condos going in there? Solaire's a great looking building. The pocket parks also seem to be better situated than usual. Agree that the county desperately needs to rethink their land use requirement re: these ubiquitous pocket parks. They're almost always completely useless and do much more harm than good. Sucking the life out of the street and completely wasting the space to boot.